Returning to Church: 4:30pm, Church Parking Lot. Note: Camp is just an hour away from the church, many families will chose to bring their child up themselves, or return them. Students need to be at camp no later than 6pm on Friday for check-in, and should be picked up no later than 2:30pm to go home. Students with sporting events can be picked up and returned to camp after their event. Please coordinate with Matt Hall. 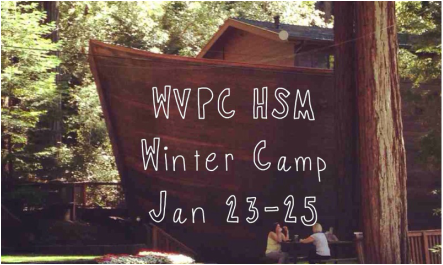 Winter Camp is put on by 13 local churches, whose youth leaders have come together to design a camp to meet the needs of students in the Silicon Valley. In addition to hearing from Adam Smallcombe, students will have the opportunity to partcipate in a series of Seminars taught by these youth leaders. This weekend also includes a lot of fun and games. Have a permission slip and behavior contract on file.